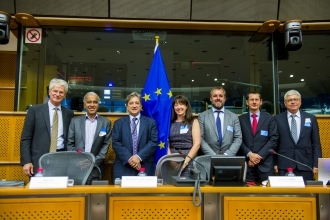 The 5th Marine Board Forum was held on 21 October 2015 and promoted awareness of the role of the ocean in climate regulation and global change, identified priorities for future research and made recommendations to policymakers. Identify and communicate the key research priorities in the scope of ocean and climate which should be supported at European level. The 5th EMB Forum on the Ocean-Climate Nexus will be held prior to the United Nations climate change talks at COP21 (Paris, 30 Nov. - 11 Dec. 2015), delivering a voice from marine research community on the critical role of ocean science as part of the societal response to climate change and on the key research priorities on climate and ocean in a European context. 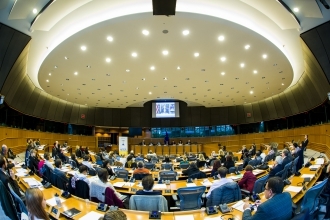 The 5th EMB Forum will be held at the European Parliament as a high-level half-day event. The target audience will include policymakers, NGOs, think tanks, leading scientists, and European Institutions for whom ocean science and climate change is high on the agenda. An event message will be immediately delivered to key stakeholders before and during COP21 and can be downloaded here. You can find the news release for this event here.